Illinois Sen. Mark Kirk was caught on a microphone called unmarried Republican presidential candidate Lindsey Graham a "bro with no ho"
Sen. Mark Kirk has apologized for what he said to a fellow senator that was captured by an open microphone on the U.S. Senate floor and offended many. Last week, Kirk, who is seeking re-election in 2016, called fellow Republican senator and presidential candidate Lindsey Graham a "bro with no ho." Kirk reportedly followed up with: "that's what we'd say on the South Side." In the statement released Monday, Kirk said he apologizes to the people of Illinois "for my inappropriate remarks last week." Gov. 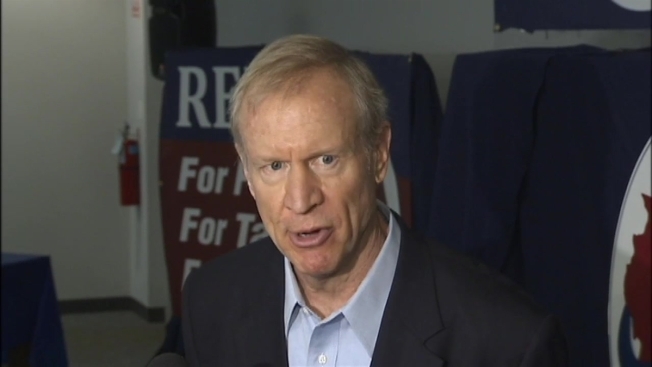 Bruce Rauner last week also used the word "inappropriate" when reacting to Kirk's comment. A comment by Sen. Mark Kirk during a committee hearing draws criticism. NBC Chicago's Lauren Jiggetts reports. Kirk, who was once married but has since been divorced, has no "first lady" himself. He is also running a re-election campaign of his own. The incumbent senator faces Democratic challengers Tammy Duckworth and Andrea Zopp in the 2016 race. Campaigns for both women issued deriding Kirk.